It is hard for most of us to believe but open discussion of the Korean Air War only began 21 years ago when former commander of the 64th Fighter Aviation Corps Lieutenant-General Georgiy Lobov began publishing a series in “Avitatsiya I Kosmonavtika” on “The Blank Pages of Korea.” In this series of articles (10 in all) he covered the Soviet side of the air war and how they fought it from their point of view. While he made some extravagant claims – 1,307 UN aircraft shot down by Soviet pilots – it was the first open source statement of fact of Soviet participation in that war. Since then there have been a number of positive changes and attempts to sort out those events. The US formed “Task Force Russia” which entered the USSR in its final days as both the US and Russia began to work with each other to find closure on pilots who had been missing in action since the early 1950s. (This morphed into what is now called the Defense POW/MIA Office or DPMO). The Russian side under the late General Dmitriy Volkogonov provided the Americans with what they called the “1059 Document” – their list of what they determined to be the crash sides of many of the UN aircraft lost during the air war. In the meantime, with the collapse of the USSR and the rise of the Russian Federation, the Russians opened up many of their formally secret state archives to researchers and analysts to check on the course of the war. 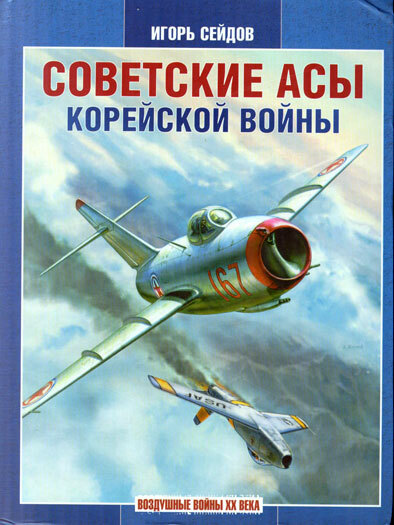 Books began to be published about their operations, beginning with one of the first ones which surfaced in the West titled “Soviet Pilots in the Protection of the Skies of China and Korea (1950-1951) by V. P. Naboka that came out in 1999. Since then there have been about a dozen good books on the subject including autobiographies of two of the leading pilots (Sergey Kramarenko and Yevgeniy Pepelyavev), a biography on Nikolay Sutyagin, and studies both of the war in general and the combat against the B-29 bomber threat. One of the more prolific authors in this area is Igor’ Atayevich Seidov, who has been working on the study of the war in Korea since 1992. His first book (with Askol’d German) was “Red Devils over the 38th Parallel” which came out in 1998 in Russia. This was the first book which followed the entire course of the war and the Soviet experience. But it suffered from being totally dependent upon the Soviet state archives, which have been shown to have some serious problems with both their completeness and accuracy. The reason for that is not hard to determine. In a state run by Iosef Stalin and Lavrentiy Beriya, failure was not only not an option but one that could prove fatal to the individual and his family. As a case in point, the case of Serafim Subbotin is an example of what too often took place. Caught up in a dogfight in 1951, Subbotin’s MiG was shot up and smoke began to fill the cockpit. He hit the canopy release and then hit his air brakes so he could safely eject from the stricken MiG. But unbeknownst to him an American pilot, William Crone, had zeroed in on his aircraft and closed to point blank range. When Subbotin hit the air brakes, Crone flew into him, fatally damaging his Sabre and falling into an out of control spin. Crone was killed in the crash and Subbotin landed safely with his parachute. Later Subbotin was told he would receive the Gold Star Medal and the title Hero of Russia for what was referred to as a “taran” – a ramming attack against an enemy. Subbotin at first protested as this was not what had happened; but then two officers from the NVKD paid him a visit and pointed out that what the command said and reported was “true”. If it was not, his next duty station would be at a place of their choosing in one of the more forlorn locations of the USSR. Frightened, Subbotin shut up and accepted the accolades. As a result there are major discrepancies among what the regiments (and pilots) reported, what the divisions reported, and what the 64th Corps forwarded to Moscow. While the real truth will never be known as to who - or where – the records were alerted, it is now obvious to all concerned not all reports were accurate. The same goes for the UN side, especially the US forces. Many books and reports from American pilots show that some aircraft which were fatally damaged in air to air combat (but did not crash over the target or in its vicinity) were either listed as “operational” losses or quietly written off some time later. Earl “Mac” McGill in his book “Black Tuesday over Namsi” noted that his B-29 was so badly shot up during that disastrous 23 October 1951 mission it was originally written off. But stinging over losses, the USAF ordered it returned to flight status over the crew’s objections. Taking off on a test flight to prove it was serviceable, the B-29 caught fired and was ditched off shore near its base at Kadena, Okinawa. The result is of course one of those “Who Shot John?” arguments, as it now appears that the Soviets never got close to the totals claimed nor did the UN side only lose about 138 aircraft in air to air combat. In this book, Igor’ has taken some of the research he did for “Red Devils” as well as a lot of personal reminiscences from surviving pilots (as with all nations 60 years on, a dwindling resource) and Western sources to write this new look at the air war. While it does provide a general timeline for the air war, its main focus is on the 56 pilots formally declared as aces by the USSR and several of the other more interesting personnel as well. The book follows the timeline of the introduction and combat operations of the various units with each pilot having his biography and combat achievements listed. The format is not much different from some Western histories such as Warren Thompson and David McLaren’s “Mig Alley - Sabres vs. Migs Over Korea”. A tone box presents a complete combat history of each pilot: his assignments, promotion dates, awards, and credited victories to include their WWII scores. Most of the more skilled Soviet pilots were, like their Western counterparts, veterans with not a few aces among them. For their victory totals, Igor’ has made a valiant attempt at matching an actual combat loss of a UN aircraft with its claiming pilot; where no actual loss was identified, he simply reports the claim which was credited to the pilot without any amplifying information. From a historian’s standpoint this is very useful information and has proved quite helpful in many cases. DPMO has used many of the Soviet reports and new books to chase down personnel listed as KIA/BNR (killed in action/body not returned) or MIA. Quite often known when or where a specific aircraft was last seen and in what conditions makes it easier to focus searches and requests to the right nation for assistance. Another useful pair of broadsides in the appendices show the difference in damages caused by a 37mm shell, 23mm shells, and .50 caliber bullets as well as weight of fire from a MiG-15 versus a Sabre. The Sabre loses in all cases except one which was not listed: volume of fire in a specific area of space at a specific time, which meant that the Sabre was more likely to hit the MiG than the MiG the Sabre. The problem with fire control and firing solutions also does not come up, even though many Soviet pilots complained that their gyro controlled gunsights tended to have the “pipper” jam to one side or the other in a dynamic fight. There are a few clunkers here and there – under the technical specifications of the various aircraft the B-26 section is unfortunately for the Martin B-26 and not the Douglas B-26 (ex A-26). But they are happily quite few. It is not known when – or if – this book will appear in English. The last book by Igor’ in conjunction with Yuriy Sutyagin, “Groza Seybrov” (The Terror of the Sabres), just appeared in English as “Mig Menace” in an English translation. But we can hope that it is translated as when it makes for a good read in Russian it should do as well in English! Thanks to Igor’ Seidov for the review copy.